Another Beautiful Day in Paradise. It was a very nice day in the 70s with just a slight breeze at the start. 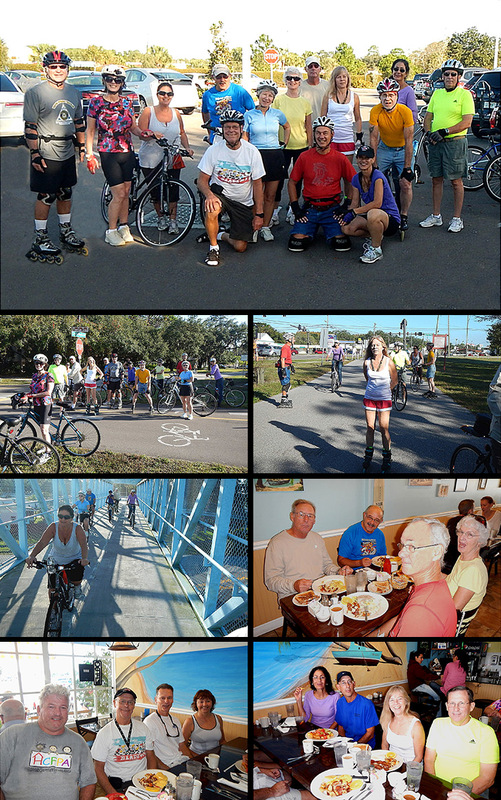 Bladers/Bicyclers Herb L, Leslie R, Amy & Rob H, Patricia K, Carol J, Roy H, Cindy S, Ronny T, Theressa V, Dave A, Bruce M, Jeff B and Kyle B came. Bicyclers Jeanine & Howard M and John R came late and missed the group picture but made it to our Brunch. We headed North as the Trail is beautifully smooth going North. Little did we know the breeze out of the South would pick up and make our return trip South a good work out. Most of the group made it all the way to Klosterman Rd and back for 12 miles. We had 4 bladers and 10 bicyclers. Leslie R became a Sponsor today. Thanks Leslie for the web site support. We Brunched at Benedicts as planned. Even thought we didn't call ahead, we got right in and seated at two tables. Service was about normal and the food was very good. Rob rated his Brunch a 9.9 but over all it was a good 9.5.